Amidst an international artistic shunning of meaning and symbolism, Marc Chagall stuck to what he loved: villages and Christ. You don’t normally expect to find Jesus Christ at The Jewish Museum in New York City. But there he is. Jesus is hanging on the cross, or floating in the sky all over the second floor of the museum. This is all because of Marc Chagall. 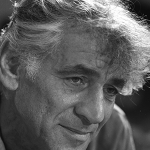 Many critics have called Chagall the preeminent Jewish artist of the 20th century. Yet, Chagall had about a five-year period during the Second World War in which he became utterly obsessed with painting Jesus Christ. Mostly, Chagall painted Crucifixion scenes. A number of these paintings, along with Chagall’s work just before and after the war, can be seen as part of The Jewish Museum’s Chagall: Love, War and Exile show, which runs through February 2, 2014. Looking at the paintings, one thing is clear right away. The paintings have little to do with Jesus as we usually see him — the central figure in the Christian Passion narrative. Chagall’s Jesus is a Jewish Jesus through and through. In many of the Crucifixion scenes (like The Artist with Yellow Christ, 1938 and Persecution, c. 1941) Jesus’ nether parts are covered with a tallit, a Jewish prayer shawl. In Study for The Yellow Crucifixion (1942), Jesus is wearing tefillin, little black boxes containing verses from the Torah that are wrapped around the head and arm, with black straps going down to the hand. 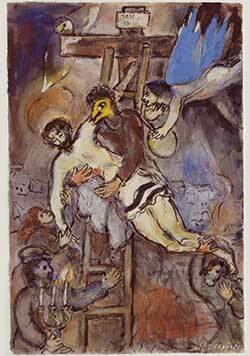 The meaning of Chagall’s Crucifixion paintings, in their historical context, is thus pretty clear. From the time of the Nazi rise to power in the 1930s, through the end of WWII, Chagall was preoccupied with the fate of European Jews. He saw Jesus on the Cross as a universally recognizable symbol of human suffering. Chagall hoped that Jews and non-Jews alike would be able to relate to this symbol. By making Jesus unmistakably Jewish, he was highlighting the fact that the Romans crucified Jesus as a Jew. In the midst of the Holocaust, Chagall wanted to make the universality of Jesus’ crucifixion specific again, he wanted the world to look at Jewish suffering. 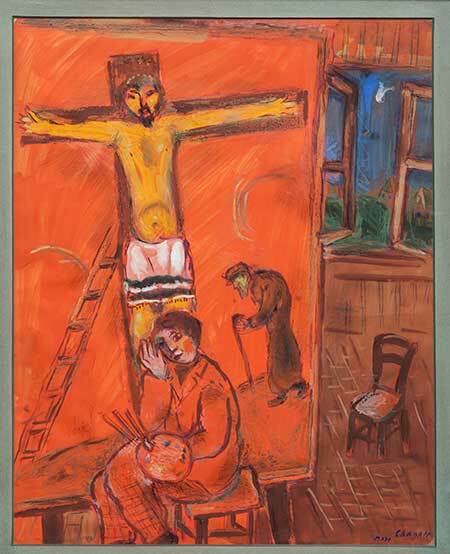 Chagall’s Crucifixion paintings, as well as much of the art he produced in the 1940s, are often considered anomalous with Chagall’s earlier work. We often associate Chagall with swaths of red and blue across the canvas, and joyous, fantastical scenes in picturesque Eastern European villages. Chagall is a red cow playing the violin, or a fiddler in colorful costume striding across the rooftops of a cozy shtetl. These paintings are vibrant with color and folksy in content. Chagall, even after moving to Paris, never lost his psychological and spiritual connection to his hometown of Vitebsk in Belarus nor to the surrounding towns and villages. Indeed, Chagall’s paintings from the teens and 1920s are remarkable in the degree to which he merges folksy content with the most innovative techniques of Modernism. One of Chagall’s most famous paintings, I and The Village (1911), features a picture plane that is deconstructed into geometrical shapes, clearly influenced by Cubism and early experiments with abstraction. 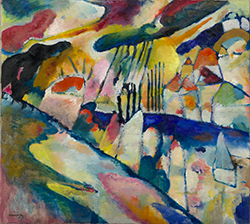 (The important early abstract painters Sofia and Robert Delauney became close friends with Chagall and heavily influenced his work at the time.) But the village in I and The Village is still a village. A man walks up a hill field carrying a scythe. Off to the left, a woman sits at a stool milking a cow. The little village houses that appear in so many Chagall paintings are here too, nestled along the hill at the top of the painting. Why Chagall stuck to his village scenes while many of his friends moved on to painting canvases of pure shape and color is something of a mystery. The idea that paintings should create accurate and realistic visual portrayals of what we see in the world had long since been abandoned. But questions of what painters should do instead were still very much alive. By the 1920s, the push to abstraction was strong. Many painters and critics became convinced that painting had to develop its own internal language, which need not — or even should not — have any direct relationship with the visual world as it is encountered in everyday life. Kazimir Malevich, for instance, was born in a little town in Eastern Europe at the end of the 19th century just like Marc Chagall. But by 1915, he was creating paintings that consisted simply of black squares against white backgrounds. 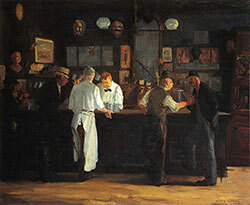 His paintings explored the rules and possibilities of composition. The village had no place in them. I don’t think Chagall ever produced a truly abstract work of art. The closest Chagall got to outright Cubism was probably his Adam and Eve of 1912. Adam and Eve are both rendered as mash-ups of geometrical shapes like you might see in a Braque or Picasso of the same period. But Chagall’s heart wasn’t really in it. Within a few years he was back to his fantastic village scenes and his folkloric content with renewed fervor. 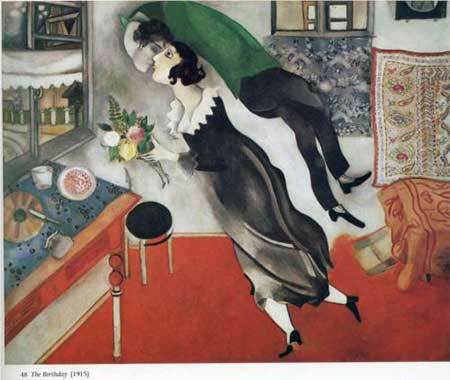 He produced Birthday in 1915, a painting in which a couple flies around a room kissing. The village can be seen outside through the window. Chagall was simply immune to the inner conflicts about form and content that ate up so many other artists of his time. Many of the painters who rejected Cubism and eschewed abstraction retreated into some form of traditionalism. Chagall didn’t do that. He took up the formal innovations of Cubism and of abstract art. He was astounded by the bold colors of Fauvism. So he took that up as well. Surrealism? Why not? Chagall loved an incongruous image as much as the next guy. Where did he put everything he’d learned from early 20th century Modernism? He put it back into the village, of course. Over time, it started to become clear that Chagall was never going to give up his favorite themes, his most beloved images — something he’d experienced back in Vitebsk, perhaps as a child. That’s why some critics have a hard time with Chagall. They like the early Chagall, but the later it gets, the more they squirm. Chagall’s art up into the early 1930s is celebrated partly because Chagall kept up a running dialogue with all the cutting-edge movements of the time. Sure, Chagall seemed to have a stubborn need to paint fiddlers on roofs, but he was doing so with a bold use of color that made his work just as relevant as Matisse. Up until the 1930s, Chagall is happily considered one of the gang, a great Modernist. Then something changed. After 1930, Chagall kept painting fantastical scenes of people and animals floating over villages. But he wasn’t as interested in keeping up the running dialogue with cutting-edge movements. By 1940, Chagall was on the move again, fleeing Paris with the upheavals of World War II. Never again would Chagall hobnob so closely with the contemporary avant-garde. From 1940 on, his work became more insular. He worked from the thoughts and memories inside his own head. Chagall didn’t go to America to discover new possibilities in art. He went there to brood upon the destruction of the world he’d grown up in. Unintentionally, however, when Chagall emigrated from Paris to New York in 1940 he was following the trail of the European avant-garde. The Nazis had, inadvertently, established New York City as the place to be for artists. It was old-world artist and European exile Marcel Duchamp who convinced Peggy Guggenheim that she ought to support a young American artist named Jackson Pollock. While Chagall was brooding in High Falls, NY, thinking about the terrible fate of Europe’s Jews, Abstract Expressionism was being born just a few miles down the New York State Thruway. Chagall was probably right to ignore Abstract Expressionism. There is no place for Chagall’s village in Abstract Expressionism. There’s no place for any village there. The people who called themselves Abstract Expressionists always disagreed about what it meant. But the term itself does give clues. Abstract Expressionist paintings are abstract, pure form and color on the canvas. The “Expressionism” part is trickier. Do Abstract Expressionist paintings express the emotions of the painter, as some have suggested? Or is something about painting itself being expressed, the inner truth of shape, form, color, line? Whatever the case, Abstract Expressionist paintings are not “about” the world in the way that a painting of a historical event, say, the sack of Rome, is “about” the world. Abstract Expressionist paintings are not symbols to be interpreted, nor codes to be deciphered. The meaning of an Abstract Expressionist painting, such as it can be said to have a meaning, is internal. Abstract Expressionist paintings are, more than anything else, about painting. Content that did not relate to the internal compositional problems of painting or to the inner state of the artist was not welcome on Abstract Expressionist canvases. It is rather intriguing, then, to consider the fact that Chagall was laboring away on paintings of Jesus Christ at the exact time that the Abstract Expressionists were laboring to extrude every last bit of external content from their work. The Abstract Expressionists were kicking the world out of their paintings. And Chagall was sitting up there in High Falls taking it all in. It is as if he said, “If you don’t want the content, I’ll take it.” Is there any more contentful image in the history of Western art than that of Jesus on the Cross? I don’t think so. The Crucifixion is almost pure meaning, pure content, pure symbol. Centuries of artistic practice have made it so. One only need scratch a cross onto a surface and a story jumps into play, a story that has ethical, spiritual, and civilizational implications. It doesn’t matter what one’s specific religious beliefs may be. The crucifix is a shared symbol filled with meaning. The symbol of Jesus on the Cross is so potent that it was irresistible to Chagall. None of the crucifixion scenes Chagall painted in the 1940s show Jesus in his historical time. Again, they aren’t about the historical and religious Jesus. In some of these paintings, Jesus hangs on the Cross and the Cross is planted in a place we can recognize. Jesus is in Chagall’s village, that mythologized version of Vitebsk that Chagall worked into his paintings hundreds, thousands of times. 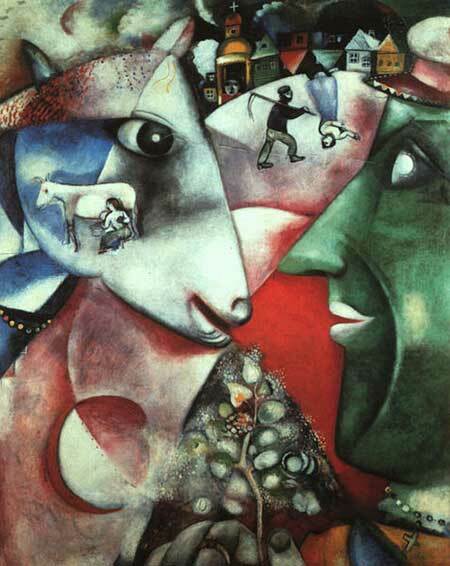 Putting Jesus into the village must have felt something like a talisman for Chagall. He was putting two great symbols together to increase their power. The first symbol, the village, was his own. The second symbol, Jesus on the Cross, was handed down to him through the history of art. Painting, Chagall was saying. Can still do this.